Likewise, here Jung is saying that Thinking is his dominant function, with Sensation being his auxiliary function. As he claimed to be an introvert all his life, this quote would have Jung identifying himself as ISTP. Now it is necessary to mention that this blurb was written well before the interview quoted above, and that Jung believed that one’s type would change throughout life (which we, the admins of Celebrity Types, don’t). Nevertheless the possibility that Jung regarded himself as having drifted from ISTP in his younger years to INTP in his mature years can well be excluded by the fact that Jung is talking about his younger years in the 1959 interview. Therefore the only sensible explanation is that Jung held shifting views about his own type. Of course, both we, the admins, and the bestselling author of Please Understand Me, David Keirsey, also hold what may perhaps be called shifting views about Jung’s type in so far as none of us identify Jung as INTP or ISTP, but rather believe his type to be INFJ. How we arrived at this typing is something which we hope to explain in a forthcoming article. Jung did not claim to be an introvert. Jung did not say that Feeling was his repressed function. Mrs. Hicks [to Jung]: “I understood you to mean that you had developed your intuition in contradistinction to your thinking? This is from the same explanation where Jung identifies as ISTP. So basically, he is saying that Thinking and Sensing are banding together as his two uppermost functions, while Intuition “sides with Feeling”, clearly denoted here as the repressed function. As will be seen from the same work, p. 90, Jung says that one “auxiliary” function is less differentiated than the other and that it sides with the repressed function. And, we might add, there are other places in Jung’s works where he describes himself as an introvert as well. Looking for to the explanation for his INFJ type. I enjoy this website and frequent it on an almost-daily basis. Thank you. Jung’s work does not indicate we have a tertiary function, instead a dominant, two auxiliaries and an inferior function. He does give an example in his work that thinking and sensing pair well with intuiting and feeling, with feeling being the least used. So as usual anyone using the MBTI system will automatically conclude that ones type changed instead of realizing that one as developed a function-attitude enough to make it differentiated and conscious. In conclusion and for whatever reasons, people surmise Jung changed from ISTP to INTP instead of appreciating he was always ISTP and developed his intuition. It seems that each person who has read Jung comes away with his or her own personal interpretation of what he actually said. I think the admins are right about their analysis of Jung. He was well-known to change his theories and types many times over and over, and even in the course of “Psychological Types”, Jung seems to contradict himself in numerous places. To the admins, I will say good job of finding the material quoted above and presenting it here, it is refreshing to see that you have a healthy scepticism towards _all_ sources, and I too look forward to the post about why Jung is INFJ. Neither ISTP nor INTP fits with late Jung because both of those are grounded in concrete reality. Jung was absolutely out of touch with the concrete, as apparent in his work on alchemy such as Mysterium Coniunctionis which has basically no practical applications, but is a neverending treasure trove of “food for the soul” by way of mystical and intuitive insights. Heck, Jung’s entire theory of the archetypal is itself a theoretical/intuitive framework which conjectures an order of validity beyond that of actual fact (i.e. psychic truths, autonomous complexes and so on). I’d say that makes him an NT who was inclined to introversion, i.e. INTJ and INTP more than ENTJ or ENTP. Can one have intuition as auxiliary but still not well developed intuition? In that case you would be aware that your intuition is not really accurate ( or could we say undeveloped ) ( you could figure it out by trial and error, and revising ) and you then could say you are developing your intuition, or in other words you are tuning (fine-tuning) your intuition. I’m having Extravert Intuition in mind, but I think Introvert Intuition is not far from there. Not sure about this, just guessing. I heard that Jung thought that the dominant 2 functions of the psyche would be introverted, so in the context above “Ti” & “Si” is supposed to be what he’d referred. Now you may think that it seems like a load of baloney, but apparently he also agreed with the notion that an introverted function would work with an extroverted one. The extroverted functions would be pulled by the way of the unconscious, so “Ti” ends would end up working with “Ne” in the scenario above. I thought this was crazy myself but perhaps you guys could be interested in researching it. I am personally unsatisfied too about his type especially the more I look into it. I’m struggling to see the strong orientation towards the extraverted value space in INFJ typing. Furthermore his writing is cold and techinical, devoid of value seeking, I’m surpised you haven’t touched on that like you did with “Custer” http://www.youtube.com/watch?v=AdkrJHu7XHs . Jung’s writing is far from NF territory in general, I know for a fact we shouldn’t expert F types to be unable to use logic since that is a stupid stereotype. However I’d expect a little homage to value reasoning in NF style expression, as opposed to the cold vibe from thinking. This makes sense. Only an INFJ would have this sort of extraordinary insight into human behavior. I’m not basing that theory of human insight on some in internet article, mind you, but on my older sister. She is an INFJ and often sees through people with a precision she herself is unaware of. She is probably ignorant of her ability because it often causes her great grief when she sees bad things in people. Another trait she has in common with INFJs I suppose. Jedi Knight: Thank you for an interesting comment. What Jung actually thought about the orientations of the different functions (and how many we have in total) is up for grabs. For that is pretty vague in Psychological Types. There are many orthodox Jungians who believe what you write; that (1) we have two functions (2) that the two uppermost functions will be of the same orientation and (3) that the two lowermost functions will be of the same orientation. Thus, if you were an “INTP” you’d have Ti-Ni-Se-Fe. Yet this is no more set in stone than that the orthodox Jungian Whitmont suggested in his book that the three other functions would have the opposite orientation to the main function, that is, an “INTP” would be Ti-Ne-Se-Fe. We prefer the same schema of functions that was originally has been developed by the people who came after Myers and Briggs (not even the first takes of the MBTI had established the function order that we know today). So an “INTP” is to us indeed a Ti-Ne-Si-Fe type. This seems to fit the best with observation. Jung was often at pains not to complicate his theory of the Archetypes by committing himself to a metaphysical theory — he wanted the theory to work whether he was talking about the brain or about the Transcendent — but that was merely a concession to the materialistic bias of contemporary science. He had no materialistic commitment himself and, when it came down to it, was not going to accept such naive reductionism. Instead, he was willing to rethink how the Transcendent might operate. We know that this is not “proof” but it’s a hint, at least. Von Franz also said Jung was an N type. I believe he is INFJ also. His work screams of Ni. Archetypes, dream interpretation, insight into human behavior, etc. Something that ISTPs and INTPs aren’t about. INTPs and ISTPs are about logic, first and foremost and his work was too metaphysical for that of a Ti dominant who strives for logical consistency. Both those types don’t have deep insight into human behavior either. Not to say they can’t, but it’s not likely for them to dedicate their work towards such pursuits at all. Also this notion that INTPs do not do theoretical framework of human behavior? Social economics, politicians. If you look look under celebritytypes.com/intp.php and you will see behavioral economist (Adam Smith, Steven Levitt) and many politicians. There work is defined by how they can define human behavior, does it mean they’re an F? no. If the objective is to get to understanding, the underlying cause of behavior and not the superfiscal, they just might just be an INTP. This is what Carl Jung attempts to do, correct? We regret that we do not understand all of your comment. You are correct that, just making a model of human behavior doesn’t necessarily make someone an F type. Ti/Ne in personalty means they are extremely theoretical, correct? The Thinker. “the speculative intellect breaking through with intuition” – Jung. They “play” with their environment. Child like wonder into their adult years. (as Einstein puts it) MBTI has shown this in their explanations, it’s common under INTP. There’s nothing practical about Carl Yung’s work, is there? He’s “playing” and building something. “What’s this do? but what’s this do? Why, but why?” Hell, it wasn’t until MBTI came along to actually make the damn thing useful. Yes, Jung is not practical (although he always insisted that he was). No, we don’t think Jung was a perfectionist of thought. Well I am not straight forward in my method in typing. I commonly see others who dichotomize traits. I put functions in context and draw from that. I see that the lines are not clear and they don’t exhibit exact behaviors. Jung insisted that behavior is irrational enough to be unpredictable. For instance, Fe can manifest it self in many forms. Which makes sense. I do not strictly use MBTI as my guide, though I am curious enough to wonder how they made their observations, and it many cases it is correct. My mistake is that I did not have all the details. (common error for INTP) I will have to look into “Jung Speaking” I appreciate the thoughtful response. 2. Jung probably had an intellectual constipation and so was compelled to pour it all out. An intellectual constipation is where there are too many ideas in one’s mind. 3. Jung probably used his writing as catharsis for his pains, especially those of his childhood and from the Freudian debacle. 4. Jung appears to have been a very competitive, ambitious man who therefore could not sit and wait to clarify his ideas before publishing. He absolutely wanted to have success now! 5. Jung appears to have wanted to undo the failure that his father was. Probably, he even wanted to avoid becoming like him. It either led to his ambition or they were separate themes in his life that had an additive effect then and thereby even inflating his ambition far beyond what one can readily intuit. And that anxiety created the confusing badly organized nature of the Jung corpus. The same that confused the man himself and created inclarities and inconsistencies such as the one you mention here. Your theory is sound. We are going to say something similar in an upcoming book we’re writing. The tendency towards schizophrenia is also significant. Anxious and with a power drive. Sums up much of why Jung did what he did. Read “The Development of the individual.” Though In continue to research this. Still seems as if he could be an INTP who stayed trued to his convictions. Repressed feeling does not mean he does not express feeling. Repressed feeling in some ways means the opposite, it can over take his “ego” His being. (Think INTP Bruce Banner Turning into Hulk) A motivator in which the Feeling in INTP is a fragmented personality that has a “mind” of it’s own perhaps because the ego is unaware. Jung perhaps is a level 3 INTP as he got older, as this makes sense because he was true to the his convictions. A popular figure of today, Steve Jobs on Celebrity types is deemed an inferior Feeling Type, and that makes sense. A seemly mad man. You could replace “Jung” with “Jobs” as mentioned in one of the comments. Does any of that say Jung at all? I have a male INFJ friend, (I know this is anecdotal) that wondered why I would even take the time to learn as much as I have been about reading Jung. He found it interesting as an N would he just found it time and energy consuming. He’s concerned about people, that’s where his energy goes. I also do understand that INFJ doesn’t follow normal form, they are the hardest to understand. The have Ti in their functional stack. However, I have Si in my functional stack, it serves my top two, it doesn’t exist in a vacuum. What we’re looking at with Jung is. … we lied and made the system simpler than it actually is. Way simpler. What really underpins this system is the notion of cognitive functions. But that’s not something we can teach you in an afternoon. So it’s important to understand that our rundown above is just a quick way to explain the system to newcomers and not what actually goes on behind the scenes. Also, with regards to “seeing the need for many of the rules in society” Jung was a political conservative and wanted people to maintain tradition rather than chase after novelties. And Ni is not a “J” function, it’s a “P” function. Not saying you’re wrong, just wanted to point out. The 20s – 40s bothered a lot of people. That may be just because he was a product of the times. World Wars weapons, sky scrapers, automobiles, long hours at work. In short, “Future Shock”. I would have to read the fiction of the day to get a better idea of what the introverts were thinking at the time. So Ne and Ni are always P in a vacuum? But dominate/auxiliary Ni is always paired with a Judging function. You can’t really separate them, that’s why “Auxiliary” is used. So in fact, MB doesn’t “dichotomize” functions. She see’s them as wholes. Myers-Briggs can’t just be brushed aside. It has a system (She was INFP, she builds systems) so she could come the conclusions she did based on Jung’s work. This is exactly what this website does. So how will I know if you’re system is superior to the one that this website follows? Where do I got to learn this websites system? 1: Nobody has ever explained the Jungian functions simply. 2: Jung was a conservative even before the 20s. 3: N and S are P functions. T and F are J functions. The functions work together, but for theoretical purposes, they are defined individually. That’s something that’s hard-wired into the system. 4: Myers and Briggs are two different people. 5: We don’t brush Myers aside at all, in fact we quite like her work. 7: Our site’s “system” is the same as the view of type that is explained by Jung, van der Hoop, von Franz, and Myers. I appreciate the response, and patience. I consider this website a great resource for understanding. I do think it’s important to analyze like this site has been doing, but it’s equally important to synthesize the functions as well. You can take a part a car to see it for it’s parts, but a car doesn’t run in parts and neither does our psyche. I’m continually trying to build this to make it easy to understand. Seeing how the functions relate to one another. Here’s how I’ve gathered “J” vs “P” is one who allows things to be as they are, this is how they can learn more, but have trouble retaining information because their mind is to formless. P would be Se, Ne, Ni These functions don’t judge their reality they accept reality for what it is, this is how they can “see” more. Bruce Lee and fictional Holmes explains this well. “Be Like Water, be formless, don’t conform things into systems, let be” “J” however is Si (What the object means to the subject, not what it is. A police officer or soldier who is all about their service, the fictional Captain America, ISTJ) and obviously Fe, Te, Ti When you mix Ni and Te/Fe, you get someone who may see themselves in a positive light because they can spin reality (Ni) to fit what they consider to be ideal (Te, Fe) This keeps them a functioning head strong, stubborn but intelligent individual that can get things done (may create a villain) because as far as the individual can discern their ego is not in conflict with reality. We understand how disagreements as to Jung’s type can be validly entertained. Jung really is a piece of work, possibly suffering from latent schizophrenia as well as two or three personality disorders on top of his type. You may have seen that we are writing a book. In that book we will go into detail on Jung’s type and also review previous claims and discussions on Jung’s type. Generally, and for now though, we will say that it is important to separate preference from ability. Jungian typology is a study of personality, not necessarily of the specific and concrete efforts and contributions that a person made. I’m aware that ability and personality are not one and the same, but what one spends time focusing on gives clues as to what personality one has and one tends to be good at what they spend their time doing. Especially celebrities who are recognized for what they have done. I’ve noticed this website is well aware of this. As an INTP myself the thing I have noticed when I read Jung’s work and how I compare his psyche to my own (INTP), this associations that connect with associations of associations and he goes on forever. Something I notice in INFPs as well. Seeing patterns and wanting to connect them which thus makes us look insane. Bringing in so much sensory information (Ne) but wanting to make connections to the point one may make them up (Ti/Si), thus looking mad. He was genuine in his desire to reach into the depths of the psyche. (Ni or objective out looking in Ne?) Couldn’t be content to look from the shore as he put it. Perhaps his Ne curiosity and Ti solitude may have taken him to the depths? 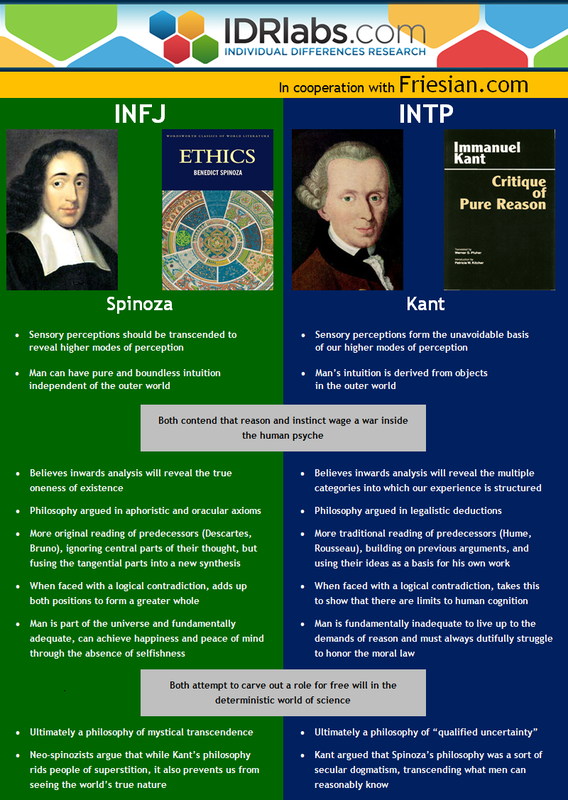 I did enjoy Kant INTP /Spinoza INFJ comparison. Nice to seem the side by side like that. Anyways, I assume your have all the evidence you need, I’m ready for that book! 1-He was ISTP and developed his Ni, over the years becoming more and more mystic. (That’s a fact) This means in his late years his 2 top functions were Ti-Ni, very similar to an INFJ. 2-He was an INTP who didn’t develop his Ne in youth, which is very strange, as he was always interested in philosophy. That’s why he started to study psychoanalysis, because of the abstract aspect. Watching an interview by him these days Jung said he was pretty strong when young, beating up the guys who messed with him. I read some researches that say sensors have more developed muscles than intuitives. And we all know it’s almost a rule. Also there’s a picture from Jung at his 30’s which he looks BADASS, nothing closer to an INFJ, hahaha. Honestly, if I could pick one type, I would stay with Jung and Van der Hoop, his well-known sucessor. Jung was probably ISTP. Even trying to forget bias, people almost always think sensors, specially Se users have no capacity to be abstract thinkers. At the main ISTP page there’s only Dyogenes. A type with Ti-Ni? Only one thinker? I sometimes think that there are great misinterpretations about types, specially with Se users. As well as INTJs have Nietzsche and Mark Zuckerberg, ISTPs can also have great thinkers and performers. It all depends on the focus of the person, even because Ti as a dominant function means you can learn about almost everything you want. Be sure that there are many ISTP geniuses mistyped with INTJs and INTPs. I don’t know how exactly (Se) works for a philosopher, but ESTPs are considered maybe the best “People readers”. Wasn’t it Jung’s ability? I have to disagree with the site on that one. I can’t see him as a feeler. To me, ISTP. Down the bias! To our mind, Jung didn’t have Ne because his observations are perceived via his own subject. Jung did indeed always say that Feeling was his repressed function. However, it does not seem to us that Jung has inferior Fe. He generally had excellent rapport with those he met. – See also the Freud / Jung letters for Jung’s showcases of Fe. As we say in the comments above, we have a book in the making where we review more than 30 prior discussions of Jung’s type and then finally set down our own assessment in stone. PS: We don’t use physical characteristics when typing. This doesn’t take away from Jung being ISTP or INTP, just wanted to point out that INFJs aren’t “sissies” and certainly not pacifist. This website gives S types their due. From what I understand, Bruce Lee, Steve Jobs and the fictional Sherlock Holmes are ISTP. Those aren’t intellectual light weights. Se as Savage isn’t quite right, more animalistic? That’s not meant to be negative, there are intellectually advantages for accepting things as they are. Living in the Now. Jung was 1000% practical. He was not proposing a “theory” of the psyche. He was describing what he saw and experienced it. I.e., his descriptions of the psyche and how it works were based on empirical observation. Do the work, write down your dreams, analyze them, have the experiences that Jung did (or anyone who does the work of individuation through dreamwork, active imagination, etc. ), and you will see that he was describing HOW the psyche functions. FACTUALLY. Not theoretically. It is only people who have not done the work themselves, that they suppose that Jung must be talking hypothetically. Or fancifully. Or non practically. The Mysterium Coniunctionis is nothing if not practical. Its only people who do not value it, and who have not done their own inner work, that they cannot see the practicality or usefulness or empiricism of it. People dismiss Jung’s assertions that he was speaking empirically. I.e., based on factual evidence (even if such facts were psychic facts, rather than concrete facts). All I can say is, do the work (of individuation). And you will see the facts that he was describing. Yes, Jung was introverted. Yes he was introverted intuitive. And yes he was a thinker concerned with objective reality (Te) and cut off from his own introverted Feeling (Fi). His inferior was Se. This is why he spent all that time doing stonework (chiseling objects out of rocks, or chiseling inscriptions onto stones). That’s why he would retreat to the property by his lake and built a stone tower with his own hands. And why he so carefully worked on the drawings in his Red Book. He was consciously engaging his inferior Sensing. Yes, that means he was INTJ. And so when he wrote that he was “as a natural scientist” he was engaging thinking and sensation, this is because he was. Te and Se, in an extraverted direction, when he was acting as a “natural scientist”. *As a natural scientist* he was called upon to use these functions. And when he says he had a poorly developed connection to feeling, this is because he was disconnected from his Fi, which is typical of younger INTJs. (Though in the videos of him speaking to the BBC towards the end of his life, it can clearly be seen. “The world hangs on a thin thread…”). It is true that Jung is qualifying his remarks with “As a natural scientist…” yet as you can see he also explicitly says that Feeling (not Sensation) is his inferior function. Likewise, in the BBC interview, he says that he was characterized by Thinking but with a great deal of Intuition too. And in the E.A. Bennet biography on Jung, which was approved by Jung, Jung is described as a Ti type. Jung always identified himself as a Ti type and never, ever said that he was an Ni type. As you can see from our site, though, we agree with you that Jung was in fact an Ni type and that Se was in fact his repressed function. We don’t agree that he had Fi/Te, though. Where an I get information about the book? Our book is 70% done but we are swamped in other work and tasks, which is a real pity. As far as we can see it will be the most comprehensive study of Jung’s type ever published, but alas we must prioritize work that pays more. So if you know any rich patrons, who might allow us to prioritize more pure research, do let us know. In the end of all this the debate is INTP vs INFJ. INTP. Ti/Ne/Si: Ne: Passive observation, not seeing things as good or evil one being superior to another. Not needing a God, not needing the finite. Just infinite curiosity. Si: Seeing the inner world as “real” as the Se (Such as Bruce Lee) see’s object world as the most important and adapts well to it. The Si see’s the inner world as “what’s real” and adapts well to it because it is comfortable. The Si in INTP is slightly repressed so it emerges a bit like the Se does for INxJ and ENxJ. Where it tries to attach itself to objects, Si on the other hand attaches itself to the subject. Seeing the dark and the light side at the same time. The polarity of slightly repressed Fe and introversion which tends to create a wounded soul seeking answers. Which is why INJFs make counselors of the depths of the unconscious as they have to deal with their own fragmented soul. Ti: Repressed slightly so tends to have a immature cynicism about the plight of humanity so the Fe repressing Ti yearns to correct modern man. Encourage development of the psyche by spiritual means. Like many INFJs, he has an interest in fiction, dreams, soul searching as it relates to collective unconscious as it shines light on the soul. Jung’s rather derogatory description of Fe and his assertion of his thinking function being the predominant are dead give-aways; he was NiTe, INTJ. I say that he was INTJ rather than INTP as Fe is the function that they are allergic to. I urge you all to study the far superior form of typology, as it is far more Jungian than Myers-Briggs. Intertype relations are accurately and explicitly explained. — > Steven Parker – I must have missed what you are referring to – what is the other typing system that you are recommending? I also believe Jung was an INTJ btw. Okay, that’s cool. So do any of you feel up for arguing Te? I would just like to ask if this debate is still ongoing? I find it fascinating how many of the commentators show various degrees of understanding of the types/functions/Jung defined by his work/Jung defined by his character, and all points of view have merit and logically fit to some degree. Yet there is a clear common lacking of integration of the finer details with a bigger picture/outside the box approach, which is crucial. Jung gives us the clues after all! I have always struggled with the standard INTP assumption for Jung. His spiritual, moral, creative and ethical drives, so charged with energy and purpose do not lead to that amount of work and self sacrifice simply by idle or scientific curiosity! His incredibly ahead of his time insights, discoveries, academic bravery and diverse integrating of scientific, artistic and spiritual disciplines are so starkly driven by a well of meaningful sense of higher purpose, which is an idealistic, emotionally rooted source. He rebelled against the strict scientific system as he saw how such restrictions were limiting. But of course in his papers and earlier works he of course has to rigorously conform to these rules, or he just wouldn’t even be taken seriously, no matter the richness of his insights. Anyone who does a Science degree at uni can tell you that! Hence when you compare the stark contrast in writing style, use of emotive language, metaphors and flowery unstructured writings of his red book works for instance, you see the real Jung writing in his essence. He was incredibly creative, artistic, spiritual, multi-faceted and complex, and also, a very rigorous scientist. He had highly developed functioning across the board, but was also a human being, and full of doubt/self-criticism, you name it, he experienced it and explored it. In short, his life work is undeniably embodying of the drives of a highly feeling and intuition driven moralistic, yet highly rational and objectively thinking lover of subjectivity! Gifted in all functions more or less! If he is going to fall into one of the categories, only infj is truly satisfying of all aspects. It is so easy to follow and judge by stereotypes and cliché charactristics, but a deep understanding of Jung’s essence can be rationally AND intuitively deduced with flexible yet logical and unbiased integrating of the abundant clues from the Jung universe… but how/where/why/which/what…??! Think like Jung! Thanks for your comment. The debate is still ongoing. We just had two people argue for INTJ on another of these pages. Perhaps Ne is “directed” inward and Ni is directed outward. Direction, Finite, Derived, Produced, relationship comes from the rational functions. An INTP directs their perception/Ne inward to the dominate Ti Function. As we know with the Jungian understanding, the dominate function takes a stronger president over the auxiliary. Let’s be honest, INTPs spend their time in their minds, the true abstract types. As INFJs though understand theory and abstraction, spend more time in the practical environment as they direct their psychic energy in that direction. On this site we use the standard model. It seems that we are in agreement to Jung’s functions (Ni & Ti), but not as to the order of them or to the model. When reading Jung’s own work as it relates to the play of opposites (Enantiodromia) his model was “corrected” by the “standard” MBTI model. Naturally Ne, to be an Ne, would need to repress stability (Si). And Ti (Cynic) would need to repress (Fe) gullibility. The ego habituates one option over the other. Though in some ways Jung’s model still stands, as, for example, an INTP. Si and Fe exist in such an unconscious/primitive/archaic state it hardly seems correct to assign it a temperament. I do think that Jung is Ne as he holds no -practical- order/reason/T/F to his observations as he is as abstract as they come. I do look forward to the INFJ argument. But I wanted to make clarification on my Ne Model/Theory for Jung. iNtuition is abstract. As iNtuition separates itself from the sense impression. Introverted thinking/Feeling is abstract. As it is the subject removing rational thinking/feeling from the object. Therefore, INTP/INFP are the most abstract types. Ne + Ti/Fi. They “Fear” or “Want power over” the object so much they hardly interact with it directly. The anxious “Jewish like” types. The INFJ and INTJ are not as “abstract” because of the extroverted someone what unconscious rational auxiliary which look to “direct” their objective world. (They mull over the different ways they can understand the world to complete a task. Their Ni is directed by Te/Fe. Te and Fe are not abstract. (Ni can not live a vacuum, it must interact with a rational function. We can abstract a car part a conceptualize it’s purpose, but for it “work” it must be apart of the a system, same with the psyche.) Ni is directed outward to the rational, Ne is directed inward to Ti. To put it simply. Jung spends most of psychic energy on his mind and is that not the definition of abstract? and isn’t the INTP the most abstract type? >To put it simply. Jung spends most of psychic energy on his mind and is that not the definition of abstract? and isn’t the INTP the most abstract type? Jung is quite the enigma as I see him on both sides in that comparison. As he was influenced by both of them. My key point which I think was missed was it’s the combo of Ti and Ne. Ne is auxiliary, not secondary. Ne does not behave as if it’s orientated like an ENTP. Ne in the INTP serves introverted thinking. The INTP is abstracting, removing, “hiding” from the world. in it’s aprior mind, observing not from “external” reality but from imagination but attempting to keep objective logical consistency. In other words, Ne really there, though tucked away, behind introverted thinking, doing Ti’s bidding. If we go with Jung, he discussed the introverted thinker as working with the subjective factor. To put the discussion is a more practical direction, Jung as INFJ would be more inclined to write self-help books as oppose to theoretical meanderings. Wasn’t the story with Jung is that he ran off his patients cause he’d get caught up in theory and they’d go with other Jungians have more practical matters addressed. He didn’t seem as interested in helping people as he did in building a theory. I apologize for the continuances of this discussion as I’m as interested in the topic as this website. I’m willing to see Jung as INFJ. I can drop my understanding with a more complete understanding of Jung. The question for me is, did he see his journey through the psyche as a moral duty a desperate attempt to relate to his visions from when he was a child (INFJ) (a bit of a Freudian observation lol) or was he just as hopelessly curious as any INTP? As we said, we have a book in the works that will be the most complete review of Jung’s type in writing to date. We agree that Jung had Ti, but not Ne. – Ne types do not attach overmuch to the particular observation; it is more short-lived before it rushes on to the next observation. Ne does not imbue its observations with overmuch subjective content. It is therefore more ‘perceptive’ and less ‘creative’, as it were. Jung was the latter; by wide agreement his observations are overly subjective and imbued with personal overtones. Fact #4 in this post gives an example of Jung’s “personalization” of intuitive content, which speaks for Ni over Ne. Jung did try to appear as a scientist, even by his own admission. But no, he was not the INTP making “silly” experiments for curiosity’s sake, such as Charles Darwin did (Darwin’s own phrase), just to see what the outcome would be. As Jung said himself in 1925, his visions were “a very serious” matter for him. Which indicates Ni again, if you read the last two paragraphs of this post. All in all, then, it would seem that Jung had Ni and Ti both accessible to consciousness, which could (by the standard model of the functions) only mean that he was ISTP (as he said himself, early on) or INFJ (which he never said, and he would probably have been quite angry if it had been suggested to him). Jung didn’t necessarily scare off the patients by talking about his own interests instead of their problems; he was quite charming and beguiling, so most people found it interesting to be in therapy with him, even though he was actually talking about his own interests. INTJs on the other hand can be irritated by opposites. The INTP plays with opposites by seeking TRUTH. (Ti) THE INFJ Seeks, and observers opposites seeking JUSTICE (Fe). Truth and Justice are clearly related concepts. Jung felt it was his duty to let the unconscious be known. He was seeking justice for a part of us that he felt was left behind. This particularly explains why INTP and INFJ can cross paths as with the Jung and Thomas Jefferson debate. As well as it’s not a surprise that Madison (INTP) and Thomas Jefferson (INFJ) were friends. Also, if you know someone is introverted, Ti-like, and intellectual, you end up with INTP/INFJ as the only possibilities. Though this method is not exhaustive; it can make people who are other types (such as Ron Paul) get erroneously slotted into the INTP or INFJ bracket. With regards to Jefferson, it was really Keirsey Sr. who pioneered that typing. Generally, we have a lot of respect for Keirsey Sr.’s type assessments (though not his theory), so the claim should be taken seriously. But we have researched it again and again and believe INFJ is more likely. It would be great to hear some more intelligent voices on the matter, but a lot of what you see online and in books is just a copy-pasting of Keirsey’s original claim. Minor comment, in case nobody brought it up: it has come to be my understanding that, in his Freeman interview, the real meaning of being at “variance” with reality is inferiority of sensation, not introversion, even though I at first thought introversion is likely. Note that I think at this time, Jung identified himself as having thinking over intuition (and possibly considered himself a thinking and sensation type), as he remarks at another point that as a man of intellect, the existence of intuition is something he wishes weren’t there, but that he must acknowledge it nonetheless. I think there’s some evidence (I forget where I saw it) that Jung considered his introversion so clear that he might not even have bothered to comment. Something to the order of “of course” everyone would call me an introvert. Maybe in one of Walter Kaufmann’s discussions of Jung and Freud, and how he felt Jung botched up Freud’s introversion. One reason this is important to note is I’m not sure it’s entirely clear if he identified his dominant function in that interview, although being “characterized” by thinking might be regarded as emphasis. I just have this suspicion, because of all people, I think von Franz wouldn’t be one of the first to report a type for Jung which contradicts his self-diagnosis — they knew each other immensely well and presumably discussed this in depth I imagine, and I get the sense von Franz thought quite alike to him. And as your site notes, and as is clear from her book, she calls him an intuitive dominant. Jung thought one could change the personal type, and it’s clear he thought he was ruled by thinking originally, but which type pattern is “most him” is the question. As for attitudes, I think he was an introverted intuitive/introverted thinker, as do you although I don’t go by the traditional model necessarily to give extraverted feeling as auxiliary. Personally I think he sits somewhere in between those, and can’t see a way to choose one or another, and think most attempts might just end in shifting/speculation. Just to be clear, admin, my main aim there wasn’t to suggest Jung necessarily thought himself an intuitive dominant, and that is the mostly speculative part of my comment. What is to me more likely than speculative is that Jung was revealing his two inferior functions and two superior functions, consistent with what you say about von Franz/Jung frequently being a bit loose about which is the dominant and which is auxiliary. Along with the evidence you cite about the Ti-Fe type claim while also claiming she is the same type as Jung, in that same interview, she refers to herself as a thinking-intuitive type, like Jung. Yet — in her book, she seems to pointedly distinguish a thinking-intuitive from an intuitive with good thinking! I think based on that Tavistock quote, the language strongly suggests the “variance” with reality refers to inferior sensation, not introversion. But again, not inferior as in 4th function, but just one of the two – either function 3 or 4. That said, I do think Jung thought he is a thinking dominant for much of his life, and if you have alternate evidence besides this interview that he thought Ti>N, that’s very plausible. I just think some may read the Freeman interview to suggest thinking dominance because hey, he seems to mention inferior feeling but not inferior sensation – rather, I think he is very likely mentioning both. Ok, then we agree – Jungians often thought of type as polarized between upper and lower, as you say. It might be true that they did not differentiate overmuch between lower F and lower S. However, the opening about being “most definitely characterized by Thinking,” is much less ambiguous. You could say, if you really wanted to defend Jung self-identifying as Ni, that he is asked in the present tense and then says that type changes, only to then reply in the past tense. But as you seem to agree, at the end of the day there is no record of Jung self-identifying as an Ni type at all. As for von Franz, she seems to speak of type in the tight sense in her book, i.e. distinguishing between Ti-N and Ni-T, while in the interview, she appears to be using type in the loose sense that we mentioned in our last post. Yes, there’s definitely nowhere I’ve seen in print Jung claim he’s an intuitive outright. And even if he did claim it at the end of his life, he’s called himself thinking dominant so much more consistently that I think it’s hard to accept it being suddenly erased. Which is why I called my comment just “minor,” more a small proposed correction of the idea that Jung was referring to his information when he referred to being “at variance” with reality – or at least, I once thought this referred to introversion but think otherwise nowadays. Now the reason I mentioned the von Franz speculation (i.e. it seems pretty non-loose that she identifies him as intuitive dominant in her book) is simply that it’s a bigger deal to me somehow that she would call him an intuitive (dominant) than it is that say, modern theorists do. The reason I say that is that the MBTI and the classic Jung framework differ in noteworthy ways, and I think it would be less shocking to claim Jung an intuitive from the standpoint of the MBTI. I notice you have various proposed (by Jung himself) thinking dominants listed as intuitives (I think Schopenhauer, Jung both are examples), and find this sort of thing more understandable in the modern framework. I think in his original framework, it’s a lot harder for me (personally) to accept Jung as any kind of clear intuitive dominant – if anything he was probably too intensely intuitive and thinking oriented (in his own system) to easily pick. The “bar” for how outside *both* rationality and reality you have to exit to be an intuitive just seemed higher in Jung’s framework. I daresay some actually did away with one of these, but not enough with the other to warrant an intuitive type. Anyway, just wanted to say in passing that your site rocks in terms of gathering lots of key information. I daresay I’m quite a careful forager for key info, but have time and again found new things on here that I’d not heard of. Yes, thank you. :) We do our best to read the books and such. Do you have a website as well? As for Jung’s framework, he identified Thinking with intellect, so as you say, a lot of intellectual people were thinkers in his view. However, even the first generation Jungians that surrounded him objected to this view. I think it was Jacobi or Hannah who said after his death that he was “obviously an intuitive.” Which is bad for Jung (because he was off) but good for the system because it means (contrary to popular criticisms) that there is some kind of observational basis for the system, slight as it may be. So even classical Jungians tend to be closer to the MBTI conception of N that Jung was, while still allowing for the fact that they use different function orders etc. I do not yet have anywhere I’ve written my thoughts up coherently – perhaps it should come some day, though! That is extremely interesting about the change in framework – any good particular places to read about what first generation Jungians thought of Jung’s concept of intuition? And “obviously an intuitive” refers to his main function, or one of the two main ones? You know, this actually always struck me: von Franz’s version of intuition just seemed so much more realistic to what someone with background in the modern theories like MBTI or socionics would know. The reason I think philosophically this isn’t a bad move necessarily is that the playing field is still kind of even: where sensation would now seem to be “more irrational relative to intuition” than it was before, actually it’s quite clear from the start that sensation, while closer to pure perception, by virtue of its definiteness already did not oppose the psychology of judgment arguably as much as did Jung’s original intuition. For instance, who would consider taking detailed measurements in a chemistry lab using sensation (but accepting them as facts, without necessarily looking for an entire theoretical foundation) nearly as opposed to the rationalistic mind as following a wild hunch (closer to some of the original portrayal of intuition)? and wonder – this was the man’s description of his dominant function back when he identified with thinking and sensation! True, in his original formulation, the larger orientation to phantasy of introversion resulted in an almost intuitive flavor to every introverted function (hence why introverted thinking coerces the facts into the shape of the idea, vs extraverted thinking being slavishly tied to facts). But isn’t it a bit of a stretch to say this doesn’t slant intuitive?! I can come up with a lot of theoretical rationalizations as to why such a character can still “repress intuition” but it seems to me that the lines get blurred between an introvert’s access to the unconscious archetype and the intuitive’s. One might say well, as Jung did originally, that intuition only perceives the idea, never reasoning about it. Maybe this is so if we ignore auxiliary functions and speak of mostly pure types. Yet I have a hard time separating a thinking function which essentially operates in a way so as to suppress any kind of tie to the facts from a “speculative intellect” oriented to “possible ideas.” I mean, I can keep stretching it, but at some point I do have to ask if this is the ideal way to categorize. I should say, though, in slight addendum to the above, that even if some of the modernization of N is OK, I think when working with functions, rather than the plain dichotomies, care must still be taken to not essentially equate N with abstract and S with concrete. I do think it is important that, even if I don’t require intuition to be entirely divorced from the realm of reason, it should be clearly different from nonconcretist thought, and shouldn’t be essentially reducible to it. That is, I do think there was something strongly there to what Jung was getting at with his categorizations, just that some things were a bit stretched/overdone, and one of those definitely is to what extent he associated concretism onesidedly to extraversion, rather than to something closer to the “S” category. I think you ran into this issue in deciding whether Jung typed Newton as an S type. The same sort of issue comes up in determining, at times, whether something is a product of introverted functioning or intuition. I stumbled across this today – how neat! This is a topic I’ve burned far too many hours on over the past several months. I test as INTJ consistently (since my late 20’s), and also tested as ISTP as a freshman in college (age 17). While there seems to be an “internet consensus” that type is set and does not change, I think it’s conceivable and reasonable to understand Jung’s type to have shifted, changed, and developed throughout his life, from ISTP as a young man, to INTJ in his mid-life, to INFJ as an older man. 1) The Red Book (written in Jung’s mid-life) is, as clear as day to me, an account of wrestling with tertiary Fi. Tertiary Fi being a sense of unworthiness towards ones work, but primarily (and especially) towards oneself. Jung wrestles, over and over again, with his own inner corruption, his own sense of his existential “filth”, his lack of “enough-ness”. Assuming this, this makes Jung at this point in his life either ISTJ or INTJ. I don’t know too many ISTJ’s who think or write the way Jung wrote in the Red Book, so that gives us Jung as an INTJ at the time of writing. 2) It is possible to understand the development of Jung’s type as the progression of feeling throughout his life stages. There’s a lot of explanation I’m going to leave out for the sake of brevity, but let’s assume ones orientation towards E/I is basically biological and genetic in nature (as modern neurological research supports, and trait theory purports and argues for). This would imply that an introvert would always carry with them a “skeleton” or “framework” to their functional stack of I-E-I-E.
Let’s also assume that children, for developmental reasons, are always full of “sensing and feeling” – that is, the neurological basis for Thinking and Intuition not exist yet in an undeveloped brain. This would imply that every human child begins life as some combination of Sensing and Feeling as their top two, oriented according to their preference for introversion or extraversion. I believe it’s reasonable to see a person such as Jung as starting as a Fi dom, and at some point Feeling is wounded or becomes painful for the young child (likely as the child exists the relative safety of family home life and enters the world and begins to interact with peers around school age), and it is repressed to the inferior. Keeping in mind the “skeleton of attitude” doesn’t change, this would mean by adolescence or early adulthood Jung could have developed into an ISTP: Inferior Fe, auxiliary Se (as he started life with), and this necessarily means tertiary Ni and dominant Ti, or TiSeNiFe. 4) One of the tasks of mid-life, as Jung argued, is a making conscious of the unconscious. One might also argue that the elevation of feeling, the making conscious of unconscious feeling, is the task that Jung took on which led to and fueled his writing in the Red Book. In short, Inferior Fe (which as a young man might be experienced as the relative absence of feeling, subjectively) is brought higher into the consciousness and moves into the Tertiary. If Feeling is now Tertiary, it is introverted, so we have Tertiary Fi. If Feeling is Tertiary, Thinking NECESSARILY must become auxiliary, producing extraverted thinking. Formerly dominant Ti (Thinking being “what a thing is”) naturally shifts to dominant Ni (Intuition being “what the significance of a thing is”). If Ni is dominant, then by default Sensing is inferior, and we end up with NiTeFiSe, or an INTJ. 5) In his later years, as he continues to work through and bring his Feeling into further consciousness, we would see Jung elevate feeling to the auxiliary, resulting in his transition from INTJ to INFJ in the later parts of his life – and his writing moves from the relative empiricism and precision of his midlife INTJ days to the sometimes “over the top” mysticism of an older INFJ. His mid-life work and late-life work both showing the hallmarks of a Ni dom, but the mid-life work anchored by Te as a NiTe (his years as a “scientist” and “analyst”), and his late life work showing the classic subjectivity of NiFe. 6) There is, in this model, a nice circular “completeness” to Jung’s course of life, with Feeling beginning focused on the self as dominant feeling, and feeling ending life focused on others as auxiliary feeling. It is a self-centered feeling which is abandoned and repressed, and which is healed and redeemed, reborn as feeling for Others. This fits quite nicely with Jung’s other statements about individuation. This model also fits neatly with a conception that, in a fully realized or actualized life, ALL functions spend at least some time in the top two functional positions. And, lastly, this model fits with the idea that, speaking rather broadly, Intuition and Feeling are the ultimate developmental destination for human psychological development. I’m not quite so dogmatic on this point, but in general I feel comfortable stating that from a purely cognitive standpoint, intuition and feeling require more “brain power” to do well than do Sensing and Thinking. It seems obvious that Intuition is more cognitively taxing than Sensing, but the Western bias would suggest that Thinking is a “higher” cognition than Feeling – I think this is wrong. Rather, Thinking is higher than the primitive, undeveloped Feeling we’re all familiar with in children or immature individuals, but well developed Feeling (sometimes described as EQ in more modern parlance) seems clearly to be more complex and difficult than cool, detached purely rational Thinking. Phew! If you made it this far, thanks for listening and giving me a space to sketch out what’s been on my mind for a while. Hoping to get good feedback and critique too! For point 2 – I should have added the skeleton of attitude would be I-E-I-E **or** E-I-E-I. Apologies. Why do you think children naturally have Feeling in their psyche, rather than Thinking? What age are we talking here? And why do you think undeveloped Thinking is more complex than undeveloped Feeling? *Very* young children seem to all have a very strong preference towards Sensation, I agree. But very quickly that turns on its head – young children tend to have a much more natural relationship with Intuition than the vast proportion of the adult population, as can be seen in their love of imagination for imagination’s sake. There are a few different types of ways to view the transition from empiricist to mystic – it’s true in a Keirseyan/MBTI framework, NFs are more mysticism friendly, and NTs less so. However, I should note that compared with the original Jungian functions standpoint, Keirsey pretty much outright says NTs mistrust intuition, and while I think there are certainly divergences in exactly what people most likely mean by “intuition,” it seems safe to me that it includes the kinds of wild perceptions of the unconscious which Jung referred to. Classic NTs probably would be classified as relying on thinking and sensation by Jung. Incidentally this is close to Pauli’s choice of divide of people into thinking types and intuitive-feeling types; I think the Keirseyan NT probably corresponds to the Pauli thinking type (represented by much of the scientific community). From the Jungian functions perspective, as distinguished from the Myers-Briggs functions perspective, I think the way to read Jung is as moving from a thinking type to more and more of an intuitive type (without asserting whether intuition or thinking was dominant by end of life). Pauli’s classification seems pretty similar to Keirsey’s in the sense that Keirsey classifies a lot of pure idea philosopher types as NF-idealists. They come from the standpoint that one must extract the purest essence behind the human mind’s thinking, and that this must be intuitively given rather than deduced…so as to be sufficiently direct, pure, by virtue of its immediacy/apparent nature. Carl Jung was certainly an ISTJ. It accounts for both the INTP and ISTP arguments. He was in no way a perciever in his way of life and I dont see any Introverted thinking at all in his writings. His whole system is Te rather than Ti. I wanted to revisit this thread and say, by the way, that if we are to use the “standard model,” which is one way of slicing the pie up in my books, I think the main two types in contention would be some sort of Ni type. However, I thiiiink I might lean with the admins on this one, not the Beebe view that he was a NiTe type. However, for the sake of it, I want to write that I think some who subscribe to the NiTe view bring up Jung’s idea that he wanted not to have a “system” and instead tell empirical facts (in some sense of the word empirical that few would agree with today!). That said, in his own view of things, this was more a contrast between relative degrees of irrationality and rationality (where the more irrational types are more apt to simply report experience as it occurred than say the thinking types are). So e.g. one might ascribe that more to his being a N-type over a T-type (in the modern concepts of those things, rather than the ones closer to his original presentation). Jung was not a logical writer. He delved in abstraction and theories. So T would not be his dominant function. N had to be. He had to be an INT. In his Memories, Dreams, and Reflections, Jung talks about his peak experience building a stone house… he talks about this experience as one in which he got in touch with his inferior function. S had to be his inferior function. Yes, Ni-Se type. But where do you see Te/Fi? Interesting discussion. I was under the impression that Jung classified himself as T dominant, but when reading his biography, the N comes out strongest in my view. I could make a case for both INTP and INFJ, but if he said he was a T, then that is what we should go by. I think that nobody should put into question how somebody else types themselves, simply because we are all stuck in our own type bias and additionally, Jung understood the types or he could not have created this theory to begin with. I can see no argument whatsoever for him being an S. He describes the intuitive function (especially Ni) in such detail that he almost has to have had experience with this. I accept him as an INT, and most likely a P.
I’m sure Jung was ISTP, and our current knowledge about ISTP is wrong. People who are typed ISTP “Mechanics” are possibly mistyped. While MBTI system (or socionics and others) might not agree, Jung seemed very logical and structured in mind, especially to theorize archetypes, typology system, collective unconcsious, etc. While yes, he used a great deal of introverted intuition, he was not primarily a perceiver, he was a judging type. If you observe people carefully, you will see there are people who seem to have rigid/intentional body language, while the others have more flexible/fluid body language. This is true for introverts and extroverts. And this is not only happening in a chunk part of their lives, it stays that way in a very long time, likely for their whole lifetime. I think this has something to do with Jung’s perceiving/judging dichotomy, which can be combined with introversion/extraversion attitude. – Pe would seem to be moving their bodies freely and active, but not intentional. – Ji would seem rigid, hard, serious, and quiet. Secretly, their mind is very busy and loud and restrictive. – Pi would seem fluid as if they have no bones or standing on air, and also quiet. But they don’t appear as serious/rigid as Ji. – Je would seem almost as active as Pe, but their movement is intentional and planned. It seems as if they are in “presentator” mode most of the time. – or maybe he was biased and have a distorted image of himself. Which I think he’s not. Try to watch STPs on Youtube. Some of them would give you the Jung-ish vibe. Let me rephrase, I meant “the Jungian vibe”. My two cents, it is important to understand that the MBTI typology proposed is merely describing an ideal representation of a personality type. Individuals with a certain type, who have gone certain traumatic experiences in life, may not appear to exert that certain function (i.e. Ti as simply described by psychologists). This particularly applies to anecdotal or testimonial descriptions of another person’s suspected cognitive function. I am an INTP, although there are many acquaintances would claim that I’m extroverted. This is because through my experience and studies of people, I have learned how to use body and verbal language in communicating with people of various personality types. Only a handful of people, who are dear to me, know that I am INTP (by functional framework, not by ideal descriptions) since I am comfortable enough to share my sincere thoughts and emotions with them. As a result of my experience, I have deviated from the ideal blueprint pattern of how an INTP would develop over the years. No one can ‘change’ their personality type, but merely deviate from their ideal pathway of personality development. Many of these quotes are already featured elsewhere on the site. Now you don’t make any argument, so it’s up to us to respond to what you seem to be implying and that is that Jung did not identify as a specific type (or some version of this argument). This is both true and false. We have articles quoting things he said to the opposite effect of the picture painted here. But in a flyover perspective, Jung got looser and looser in his application of typology. This and his tendency to assert self-contradictory claims is symptomatic of his intellectual style in general once he left behind him the more narrowly clinical and typological perspective. Everything gets jumbled together. Some may celebrate his lack of respect for disciplinary boundaries and the epistemological status of truth claims, but I find it frustrating. To me this approach suggests an out-of-control Ni function. I lean toward INTJ just based on how I respond to his intellectual style. A classification further supported by his self-presentation as visionary whose personal revelations had universal validity. The position of Thinking and Intuition in Jung’s stack may not reflect the order in which he presented them in the first statement quoted. I would be wary of concluding anything based on the exact wording of a statement by Jung! The gift of Ni dominance–flashes of insight/inspiration–is also the curse of that orientation, somewhat compensated for–ex post facto–by secondary Te in INTJs). On my theory–that he was an INTJ–his dominant function would be Ni; secondary/auxiliary Te; Feeling his ‘child’ or tertiary function; and his being at odds with reality (understood as the dimension of pre-rational responsiveness to the physical world) reflected by his inferior Se. The dominance of fire in his chart suggests intuition-enthusiasm, followed by air (intellect), then earth and finally water, though there is not much difference percentage wise between the latter elements, which correlate to sensation and feeling. Astrology may be a more sophisticated instrument for gauging the style of man. Ascendant in Aquarius, sun in Leo, moon in Taurus. The moon in Taurus (placed in ‘exaltation’) and Venus in Cancer do not indicate inferior F but rather at the very least a tertiary position in the hierarchy. The predominance of fixity in his modalities seems reflected in his fixation on mandalas, on identity-individuation (what remains through all transformation) and picture-thinking generally. There are numerous square aspects in his chart, the most inharmonious of aspects, as well as three oppositions, which makes him rather complicated, a complication reflected in the difficulty of allocating him to an MBTI type. The book on the correspondences between astrology (the mother of all typologies) and Jungian typology has yet to be written, to the best of my knowledge. When it is I suspect there will be some amazing correspondences. I agree with the commentor who says what Jung meant strong sensation is about Si since we already know it is easy to value 3rd one over 2nd since the attitudes of 1st and 3rd are same and we end up in the loop. Later he realised he has the strong Ne. What he meant unconscious is Ne and it is on the same side of Fe. Out of touch with reality implies his extroverted side is intuition and not sensing – it is not about him being introverted. INTP for sure.